A swarm of honey bees is fairly distinctive, although sometimes certain bumble bees [the tree bumble bee for example] can resemble a swarm. 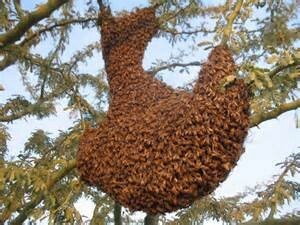 To check whether or not yours is a honey bee swarm see the information provided on the BBKA website. There are also sites which show the differences between bumble bees, wasps and honey bees. To identify a swarm collector near you, go to the BBKA site, and enter your postcode. RBKA regrets it is currently unable to provide this service.